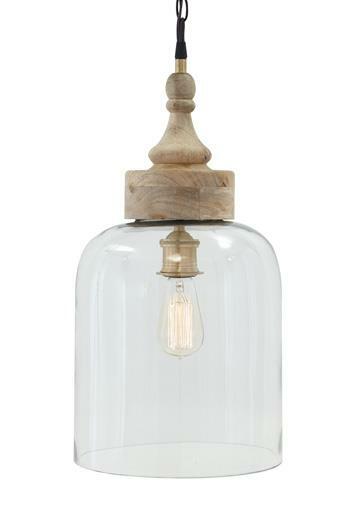 Clear glass and natural wood fixture pendant light - requires hardwire. Type A light bulb 40 watts max or CFL 8 watts max. Cord length 68.00". Bottom opening 9.50". Shade 19.50"
The Pendant Lights Faiz Transparent Glass Pendant Light by Signature Design by Ashley at Sam Levitz Furniture in the Tucson, Oro Valley, Marana, Vail, and Green Valley, AZ area. Product availability may vary. Contact us for the most current availability on this product. The Pendant Lights collection is a great option if you are looking for Relaxed Vintage Lighting in the Tucson, Oro Valley, Marana, Vail, and Green Valley, AZ area. Browse other items in the Pendant Lights collection from Sam Levitz Furniture in the Tucson, Oro Valley, Marana, Vail, and Green Valley, AZ area.